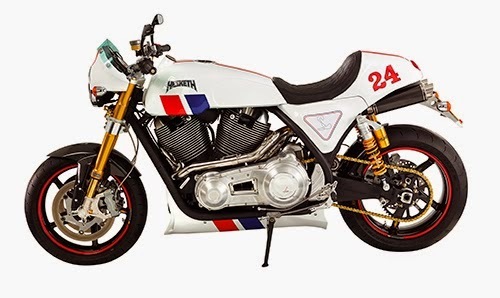 BRITISH motorcycle brand Hesketh has returned to production with the launch of a new limited edition S&S x-wedge powered model. 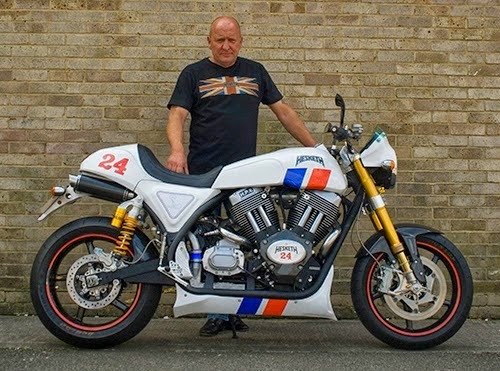 The "24" is the first new model manufactured under the Hesketh name in 30 years, and comes four years after current owner Paul Sleeman acquired the British motorcycle manufacturer. Hesketh Motorcycles was first established in 1980 by Lord Hesketh following his success running a winning team in Formula 1 car racing with British driver James Hunt. The original Hesketh V1000 motorcycle was a 1,000cc, V-twin powered sports inspired machine, and this was followed by a faired touring model known as the Vampire. and decided to buy the entire Hesketh motorcycle business. Now, four years later, he has launched the completely new Hesketh 24. Sleeman’s original idea for the 24 was to design the new bike around an entirely new British-made engine. However, the time scale and costs involved in creating a motorcycle engine from scratch proved to be too excessive and so he then began to look at off-the-shelf options, which led him to discussions with S&S Cycle and the eventual decision to use an 117ci X-Wedge, air-cooled V-twin. Modifying the engine especially to suit the Hesketh 24, the company uses British tuning specialist Harris Performance Engines, a business which has 40 years experience in pushrod engines and drag racing. 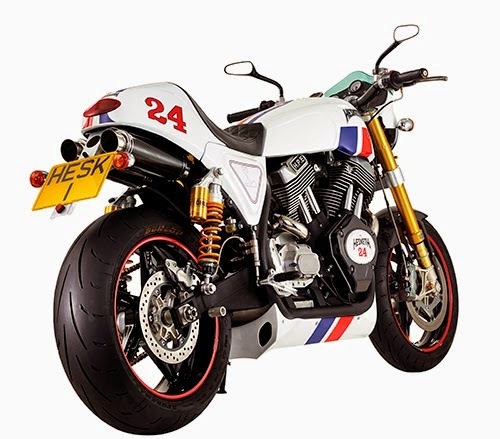 Hesketh will be offering buyers all of the limited edition 24 motorcycles with at least three different power options on the bespoke builds, with Harris providing stage engine tuning for various levels of preferred power. One change that will be made to the X-Wedge engine on all models is the air intake being moved to the left side of the motor to allow the use of a longer intake manifold for increased torque. A Baker enclosed primary is used along with a matching King Kong clutch and six-speed transmission, with a chain final drive to complete the running gear. The bike in which the tuned X-Wedge is used was inspired by the design of the RLX by US-manufacturer Darwin Motorcycles, which won the Production Manufacturer class at the World Championship of Custom Bike Building in 2011. Sleeman was introduced to Dar Holdsworth of Darwin Motorcycles by the management team at S&S Cycle and he agreed to work with Sleeman on the development of the 24, which shares many styling cues with the Darwin RLX, and Holdsworth is continuing to work as a consultant for Hesketh, with the two companies discussing ideas for further collaborations in the future. One aspect that has carried over from the RLX to the 24 is the construction of the frame by Racing Innovations, but changes to the Hesketh version include the swingarm being used as a supplementary oil tank. Another significant difference between the two bikes, alongside the lighting requirements needed to make the 24 street legal in Europe, is the use of a fuel tank under the bottom frame rails. This tank is one of three on the bike, the other two being one in the conventional location and a third under the seat. The decision to have three tanks was taken because the 24 has been developed as a sports touring bike, and a large fuel capacity was needed to make this a viable option. The bodywork, which covers those gas tanks, is in the colors of James Hunt’s Hesketh F1 car, with graphics designed and produced by British Superbike champion Tommy Hill, and Hill will be the first person to ride the Hesketh 24 in public during the 2014 Goodwood Festival of Speed. Finishing kit on the 24 features componentry from the world of racing with Öhlins supplying the suspension components, Beringer the brakes, and Blackstone Tek the carbon fiber wheels. Each of the limited edition Hesketh 24 models will feature an 18-carat gold plaque on top of the gas tank with the unique number of that particular model, and owners will enjoy full service back-up from the Hesketh team with a comprehensive two-year warranty as standard.